This edition is perfect for the individual who frequently works out of a home office and has lots of paperwork clutter they would like to eliminate (a realtor, for example) or for the super-involved parent who needs to sign permission slips and PTA forms. DocuSign works with most document formats — Microsoft Office, PDF, images — and cloud service like Dropbox or Google Drive. You also can access your documents from your mobile devices. Forget to send in that signed permission slip? No problem, just use your Smartphone to sign and send it when you drop Junior off at school. 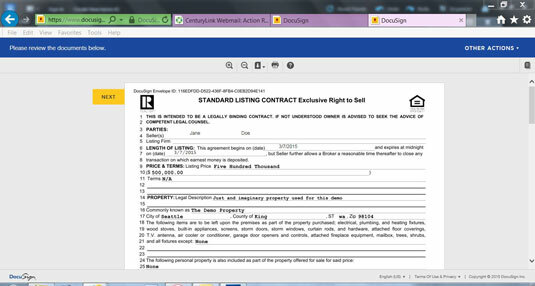 DocuSign Business Edition is designed for small and medium-sized businesses. You can use DocuSign to save your business a lot of time and money. DocuSign signatures are legally binding, so there’s no need to print, fax, or overnight contracts and proposals. Think of the amount you save from overnight mailings alone! The management aspect of DocuSign lets you track every document’s status throughout the entire process. You’ll know who has signed, if someone has declined to sign, and who’s next in line to sign a document. This gives you an amount of control that you can’t have otherwise — short of sitting in a conference room and moving a hard copy from one person to the next and demanding that they sign. 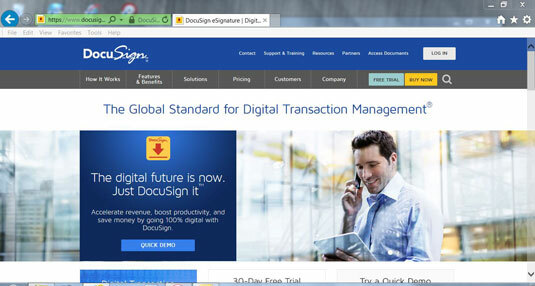 DocuSign offers a secure digital signature solution for large corporations. If you have to get signatures from someone who’s literally a world away, you no longer have to wait for printouts, faxes, or express deliveries. 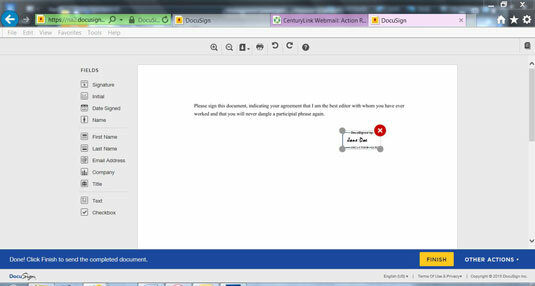 Simply have DocuSign do the work for you. DocuSign is used by 100 percent of the Fortune 100 and in companies in most countries throughout the world. Do you have to deal with someone who is in their office when you are getting ready to go to bed? With DocuSign, you can send the document during your office hours, track it from your mobile devices overnight, and have it waiting for you when you’re ready to head back to work. With the enterprise edition, you have full administration rights and can use branding tools so that your customers can easily identify documents from your company.